“It’s a lump in the throat to be here this evening, thanks,” said Poet’s Award recipient Merle Haggard, neatly summing up the evening. The 2nd Annual ACM Honors event, hosted by Lee Ann Womack, was held 9/22 at Nashville’s Schermerhorn Symphony Center in order to recognize winners from the 44th Annual ACM Awards. A large number of artists performed in tribute to the evening’s winners. One of the many highlights was Carrie Underwood singing “I Told You So,” to honor Cliffie Stone Pioneer Award winner Randy Travis. Other artist/performers included Vince Gill, The Grascals, Jamey Johnson, Miranda Lambert, Jim Lauderdale, Patty Loveless, Brent Mason, James Otto, Kellie Pickler, John Rich, Blake Shelton, Steve Wariner and host Womack. Kenny Rogers celebrates after receiving the Cliffie Stone Pioneer Award. 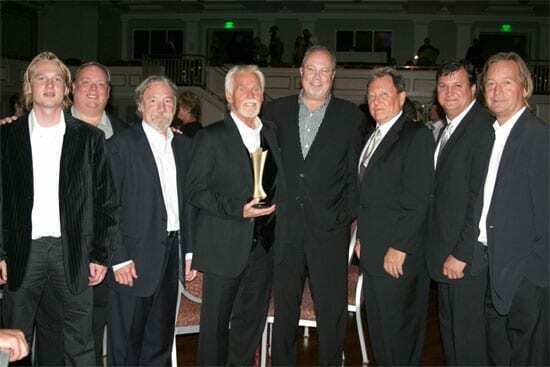 (L-R) Dreamcatcher’s Jason Henke, Webster PR’s Kirt Webster, Dreamcatcher’s Bob Burwell, Kenny Rogers, Capitol Records Mike Dungan, Dreamcatcher’s Jim Mazza, lawyer Bruce Phillips, and Dreamcatcher’s Kelly Junkerman. Presented to an individual for outstanding contributions to the acceptance of country music throughout the world. Honors songwriters for outstanding musical and/or lyrical contributions throughout their careers in the field of country music. Cliffie Stone Pioneer Award: Jerry Reed, Kenny Rogers, Randy Travis, and Hank Williams Jr. Honoring individuals who are pioneers in the country music genre. Given to a movie released and/or receiving major exposure during the preceding calendar year, featuring or utilizing country music. Given in recognition of years of dedication and service by an outstanding individual to the Academy of Country Music.